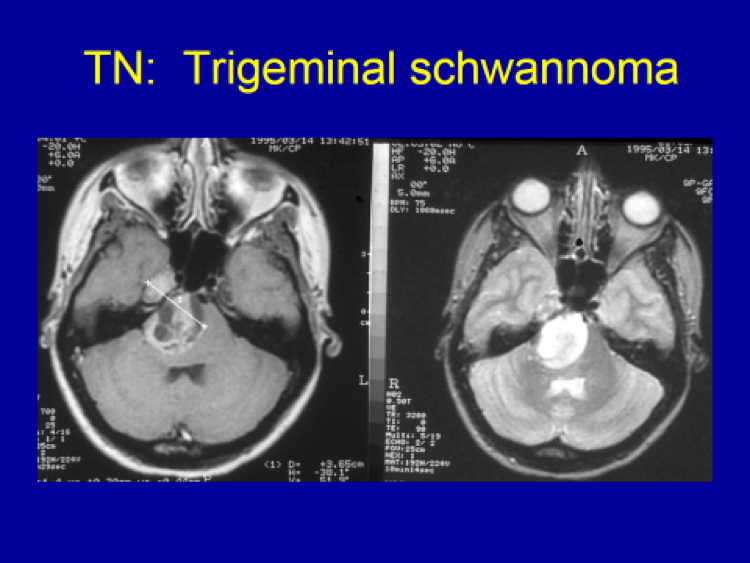 When evaluating a new patient with trigeminal neuralgia, MRI with and without Gadolinium is done to make certain that there is no underlying mass lesion along the course of the trigeminal nerve (e.g. meningioma, schwannoma, epidermoid, or very rarely, skull base cancer). 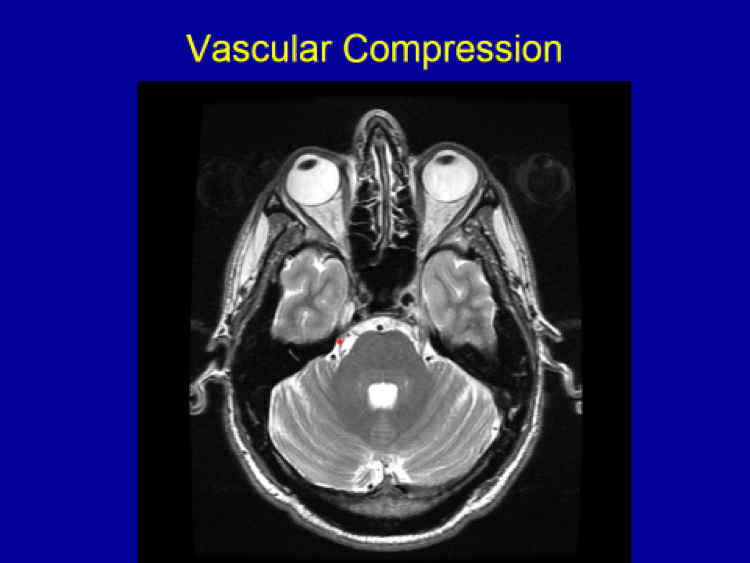 At the same time, a special MRI protocol (“CISS” or “FIESTA”) is performed to look for any possible “vascular compression” on the trigeminal nerve. 35 year old female patient’s MRI showing a large tumor arising from the trigeminal nerve (trigeminal schwannoma) as the cause of her trigeminal neuralgia. 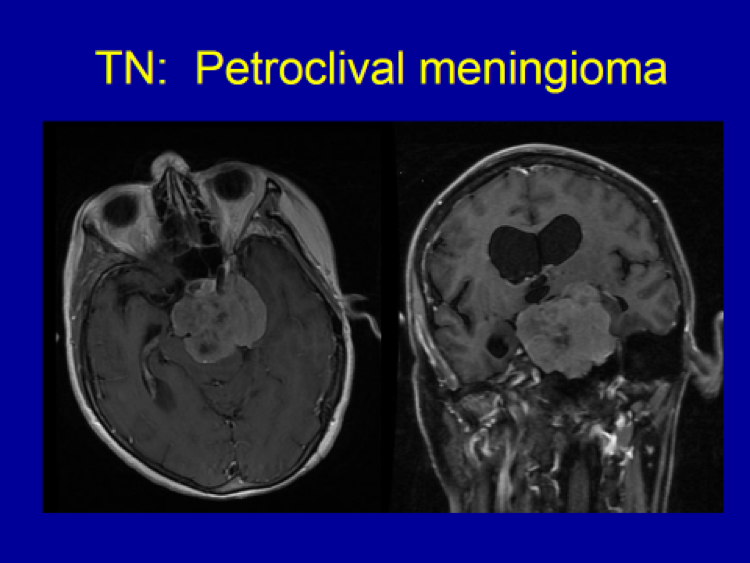 72 year old female patient’s MRI showed a massive tumor (meningioma) causing severe compression on the trigeminal nerve causing trigeminal neuralgia, in addition to other symptoms (R sided weakness, walking difficulty and headache). 42 year old patient’s MRI shows the trigeminal nerve (*) compressed by the adjacent arterial loop. Due to the compression, the trigeminal nerve appears thinner than the trigeminal nerve on the opposite side. Additionally, the nerve is “bowed” compared to the nerve that is normal and straight on the opposite side.